This Glossary includes a number of concepts and terms players may encounter while playing the game, in alphabetical order. Instead of reading this section from beginning to end, players are encouraged to only look up new concepts as they are encountered during play. To use an "Action:" ability during their turn, the active player must exhaust the card. The ability then resolves. Æmber is tracked by Æmber tokens, and is used to forge keys. See also: Capture, Keys, Reap, Steal. A player's archives is a facedown game area in front of that player's identity card. Card abilities are the only means by which a player is permitted to add cards to their archives. During step 2 of a player's turn, after they select an active house, the active player is permitted to pick up all cards in their archives and add those cards to their hand. Cards in a player's archives are considered out of play. A player may look at their archives at any time. A player is not permitted to look at an opponent's archives. If the ability instructing a player to archive a card does not specify where the card is archived from, the archived card comes from that player's hand. Some creatures have an armor value to the right of the card title. Armor prevents an amount of damage equal to the armor value that the creature would take each turn. For example, if a creature has two armor and is dealt one damage, that damage is absorbed by the armor, leaving the creature with one armor for the rest of the turn. If the creature is later dealt three more damage during that turn, one damage is absorbed and the other two damage are dealt to that creature. If a creature gains armor, the gains are additive and accumulate on top of the creature's printed armor value. If a creature gains armor during a turn, the gained armor does not absorb damage already dealt that turn. If a creature loses armor during a turn, it is not retroactively dealt damage that was already absorbed by the armor. If a creature has a "~" symbol in its armor field, the creature has no armor. Such creatures may gain armor through card effects. When a creature with the assault (X) keyword attacks, it deals damage equal to its assault value (i.e., "X") to the creature it is fighting before the fight resolves. (The active player chooses whether this occurs before or after other "Before Fight" effects and keywords). If this damage destroys the other creature, the rest of the fight does not occur. If the word "before" is used in an ability (for example, "Before Reap:" or "Before Fight:"), that ability resolves before resolving the game effect of the reap or fight (but after the card exhausts, if exhausting is required to use the card). Captured Æmber is taken from an opponent's Æmber pool and placed on a creature controlled by the capturing player. Players may not spend captured Amber. When a creature with Amber on it leaves play, the Amber is placed in the opponent's Amber pool. Unless otherwise specified, Æmber is placed on the creature that captured it. If a player has at least one chain when refilling their hand, they draw fewer cards according to the chart below. Then, they shed one chain by reducing the number on their chain tracker by one. A player owns the cards that begin the game in their deck. When a card enters play, it is under its owner's control. A player can take control of an opponent's card. When this happens, that card is placed in the new controller's play area. If it is a creature, it is placed on a flank of the new controller's battleline. If a player takes control of a card that belongs to a house not in the new controller's deck, they can make that house the active house during step 2 of their turn. If a card that has changed control leaves play for any reason, it moves to its owner's appropriate out-of-play zone. The base cost to forge a key is six ^mber. This cost may be modified by card abilities. The modified cost is referred to as the current cost. Damage a creature has taken is tracked by placing damage tokens on the creature. If a creature has an amount of damage on it equal to or greater than its power, the creature is destroyed. Damage on a creature does not reduce its power. When a card is destroyed, it is placed in its owner's discard pile. If a card has a "Destroyed:" ability, the effect resolves automatically when the card is destroyed, immediately before it leaves play. When a card is destroyed or discarded, it is placed on top of its owner's discard pile. The cards in each player's discard pile are open information, and may be referenced at any time. The order of cards in a player's discard pile is maintained during play, unless a card ability causes this order to change. When a player runs out of cards in their deck, they shuffle their discard pile to create a new deck. Elusive only stops damage that would be dealt by each creature's power; damage dealt by keywords or other abilities still applies. End of turn effects are resolved when a player's turn is over-after step 5, the "Draw Cards" step. If a card ability refers to an "enemy" game element, it refers to an element currently controlled by the opponent. When a player uses a creature to fight, the player exhausts the creature and chooses an opponent's creature. Both creatures deal an amount of damage equal to their power value to the opposing creature in the fight, and both are "fighting" for the purposes of card effects. A creature used to fight is said to be "attacking" and can be referred to as "the attacker" during that fight. If the attacker is not destroyed, all "Fight:" abilities on the attacking creature then resolve. If either creature in a fight has a constant ability referencing the end of the fight (example: "after an enemy creature is destroyed fighting this creature..")., the creature must survive the fight to resolve the ability. Only the attacker can trigger "Fight:" abilities. If an ability instructs a player to "fight with" or "ready and fight with" a creature, the ability is granting the player permission to use the designated creature to fight. The fight is resolved following the standard rules for fighting, against a creature controlled by the opponent. The creatures on the far right and far left of a player's battleline are on the flanks of the line. A creature in this position is referred to as a flank creature. Any time a creature enters play or changes control, the active player chooses which flank of its controller's battleine it is placed on. If a card ability refers to a "friendly" game element, it refers to an element currently under the control of the same player. When a creature with the hazardous X keyword is attacked, it deals X damage to the attacking creature before the fight resolves. (The active player chooses whether this occurs before or after other "Before Fight" effects and keywords). If this damage destroys the other creature, the rest of the fight does not occur. the hazardous (X) keyword, the two X values are added together. If an ability "heals" a creature, remove the specified amount of damage from the creature. If an ability "fully heals" a creature, remove all damage from the creature. Each turn, a player must choose one of the three houses indicated by their identity card, if able. Some card abilities may restrict a player's house choice. If a player has gained control of a card that does not belong to one of their three houses, that card's house becomes an eligible choice for that player while the player retains control of the card. If a player is faced with two (or more) "must choose" mandates, the player may choose either of those options. If an ability includes the phrase "if you do" or "in order to", the player referenced by the ability must successfully and completely resolve the text that precedes that phrase before they can resolve or perform the text that follows that phrase. In other words, if the first part of the ability is not successfully and completely resolved, that which follows the phrase does not resolve or cannot be performed. A reference to the "least powerful" creature refers to the creature in play with the lowest power. If there are multiple creatures that qualify, each is considered "least powerful". If an ability requires the selection of a single least powerful creature, and multiple creatures are tied, the active player chooses one. If a creature with Æmber on it leaves play, the Æmber is returned to the opponent's Æmber pool. If a non-creature card with Æmber on it leaves play, the Æmber is returned to the general token pool. If a card has a "Leaves Play:" ability, the effect happens automatically immediately before the card leaves play. If an ability includes the word "may", the text that follows "may" is optional. If a player chooses to resolve a "may" ability, the player must resolve as much of the ability as they are able. A reference to the "most powerful" creature refers to the creature in play with the highest power. If there are multiple creatures that qualify, each is considered "most powerful". The creatures to the immediate left and right of a creature in a player's battleline are its neighbors. The active player may trigger any "Omni:" abilities under their control during any of their turns, even if the card with the "Omni:" ability does not belong to the active house. When a creature is involved in a fight (either because it was used to fight, or because it was attacked by another creature), the other creature in the fight is the opposing creature. If a player must pay Æmber to an opponent, the Æmber is removed from the paying player's pool and added to the opponent's pool. When a card has a "Play:" ability, the effect occurs any time the card is played. For creatures, artifacts, and upgrades, the ability resolves immediately after the card enters play. For action cards, the ability resolves, and then the card is placed in its owner's discard pile. If an ability "plays" a card from a source other than hand, "Play:" abilities on the card resolve. If an ability "puts" a card "into play", "Play:" abilities on the card do not resolve. Poison has no effect if all of the damage is absorbed by armor or prevented by another ability-poison only resolves when one or more damage is successfully dealt. Poison refers only to damage that would be dealt by the creature's power, not by damage that is dealt by keywords or other card abilities. When a creature is given a "+1 power counter", one such status card is placed on the creature. For each of these cards that is on a creature, that creature's power is increased by one. If card text instructs players to repeat a preceeding effect, the entirety of the effect before the text providing the instruction to repeat resolves again. When a card is purged, it is removed from the game and placed facedown beneath its owner's identity card. Purged cards no longer interact with the game state in any manner. A card's rarity symbol can be found at the bottom of the card, near the collector number. A card's rarity (common, uncommon, rare, or special) is used by the deck-generation algorithm to determine how frequently it will appear in decks. Special cards have a different type of distribution and do not obey the game's standard rarity rules. When a player uses a creature to reap, the player exhausts the creature, gains 1 Æmber for their Æmber pool, and then all "Reap:" abilities on the creature resolve. When captured Æmber is returned, it is placed in the opponent's Æmber pool. When a card is sacrificed, that card is considered to have been destroyed, and any "Destroyed:" abilities the card has resolve. If a card's ability refers to its own title, that reference is only to itself and not to other copies of the card. This applies only to damage that would be dealt by the opposing creature's power, not by damage that is dealt by keywords or other card abilities. When an ability deals damage to a creature "with splash damage", the splash damage is dealt to each of the target creature's neighbors. When an ability steals Amber, the stolen Æmber is removed from the opponent's Æmber pool and added to the Æmber pool of the player resolving the steal ability. When a creature becomes stunned, place a stun status card on it. The next time the creature is used, the only thing that happens is the creature exhausts and the stun card is removed. It does not reap or fight, and any "Reap:", "Fight:", or "Action:" abilities on the creature do not resolve. Constant abilities and abilities that do not require the creature to reap, fight, or be used are still active. While a creature is stunned, it cannot become stunned again. 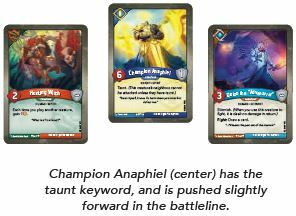 Champion Anaphiel (center) has the taunt keyword, and is pushed slightly forward in the battleline. If an ability refers to an effect that occurred "this way", it is referring to an effect that was produced by the same resolution of that same ability. Traits are descriptive attributes (such as "Knight" or "Specter") that may be referenced by other cards. Traits are listed at the top center of a card's text box. If a previously forged key is "unforged", flip the key token to its unforged side. The key no longer counts toward its controller's victory condition and must be forged again to win the game.